Weapons policy • Young draws on open-carry law, saying it threatens educational endeavors. 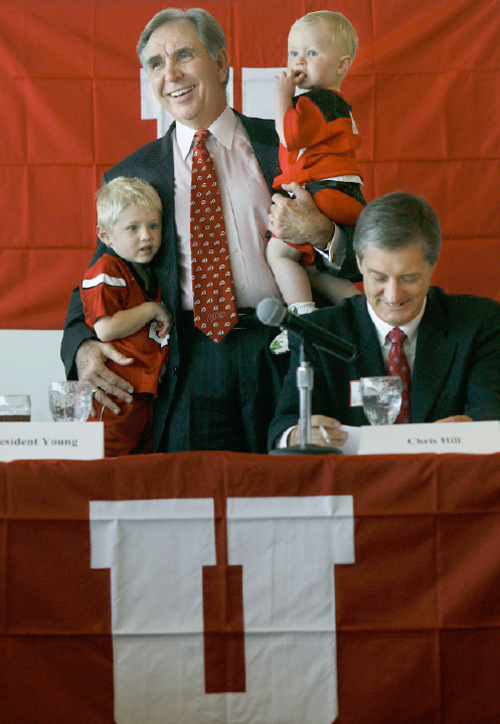 Scott Sommerdorf | Salt Lake Tribune University of Utah President Michael Young holds his grandsons Trevor, left, and Bryce Owen as he talks about the University's acceptance of the Pac-10 invitation. Athletic Director Dr. Chris Hill is at right. The University of Utah officially accepted the offer to join the Pac-10 conference. The University of Utah's president asked school trustees Tuesday to help thwart possible legislation allowing the open display of firearms on campus, a move that could reopen a contentious debate between educators and lawmakers over gun policies. At stake are the university's ability to attract top faculty as well as its contribution to the state's economic development, Michael Young told trustees at their regular meeting. "This needs to be a higher-education issue, not a University of Utah issue," said attorney Randy Dryer, who chairs the trustees board, which includes many politically connected businesspeople. Guns on campus have been a long-simmering issue in Utah, predating Young's tenure as president. After a contentious legal wrangle, the university was forced to allow concealed-weapon permit holders to be armed on campus. But U. authorities drew the line at open carry, attracting the ire of gun-rights advocates. "They don't have the ability to restrict to open carry. The only thing they can restrict is the discharge of firearms," said Rep. Curt Oda, R-Clearfield. Oda knows of no legislative effort in support of open carry, but he said that could change if the university continues asserting its ban. "We won't tolerate it," he said. The issue reignited last week after the U. suspended two campus police officers with pay for releasing internal protocols that guide the handling of people who openly carry guns. "Law enforcement never wants to release those protocols," Young told trustees, noting that the school has never hidden its gun policies. The officers have been reinstated with no further disciplinary action, according to university spokesman Remi Barron. One of the officers, Zach Wellman, said he is happy to be back at work but hopes the university aligns its gun policies with state law. "I would like to see the Legislature clarify Utah law so this won't be an issue next year," Wellman said. A 2004 law prohibits universities from enacting policy that "in any way inhibits or restricts the possession or use of firearms." But U. officials have long cited other state laws giving them authority to regulate weapons  just as anything else that could jeopardize the peace and security of campus life. The prospect of renewed legislative wrangling over guns dismayed Young. "It's sad because we have so many more important things to talk about," Young said. "I've worked hard to put this issue behind us." Young said the university can't know how many concealed-weapon permit holders are on campus because authorities are barred from asking except when responding to a complaint. Campus police know of only a handful of incidents in recent years. Most were inadvertent displays, and one involved an off-duty police officer. In one recent episode, a U. employee left his weapon in a bathroom. No citation was issued, according to campus police. "That was an 'oops,' " said U. Police Chief Scott Folsom. In a Jan. 7 memo to members of the State Board of Regents, which has oversight of all public colleges and universities, Commissioner of Higher Education William Sederburg said he believes U. gun policies comply with state law. "It seems clear enough that a concealed weapon is just that  concealed. This only makes sense. Allowing openly carried weapons on campuses is unnecessary ... and would be highly disruptive to the educational mission at our schools if persons carrying weapons openly were to begin entering our libraries, classrooms, dormitories and other facilities," Sederburg wrote. The memo reiterated Young's position that open carry would harm faculty retention and recruitment. While Young isn't personally bothered by firearms, he said some scientists he hopes to woo from East and West coast schools such as Harvard and Stanford have little patience with Utah's pro-gun climate. Young said losing high-profile researchers means losing potential grant money that helps fuel Utah's economy. "We are competing with the best. I worry [open carry] will set a thumb on the scale against the university," said Young, a Brigham Young University graduate who spent much of his academic career in Asia and as law school dean at George Washington University. "I don't believe that a bit. There are number of professors who are not afraid of law-abiding citizens carrying guns," Oda said. "It's all based on emotional rhetoric. That tells me they can't find decent professors who are conservative." Guns on campus has become a national issue since Utah passed a law in 2004 prohibiting any college or university from enacting policy that "in any way inhibits or restricts the possession or use of firearms." The Brady Center to Prevent Gun Violence singled out Utah's 2004 law for criticism in a 2007 report decrying the spread of state laws forcing campuses to accept guns. "Once academic institutions are stripped of their right to set gun policies for students and faculty, almost no barriers remain that would keep schools from becoming 'gun-filled' zones," said the report, titled "No Gun Left Behind." A new controversy recently erupted over a University of Utah protocol that requires campus police to ask anyone openly carrying a weapon on campus to conceal it or leave. Guns rights activists argue that Utah colleges have no legal authority to ban open carry.